Italdesign Giugiaro S.p.A is a design and engineering company and brand based in Moncalieri, Italy, that traces its roots to the 1968 foundation of Studi Italiani Realizzazione Prototipi S.p.A by Giorgetto Giugiaro and Aldo Mantovani. Best known for its automobile design work, Italdesign also offers product design, project management, styling, packaging, engineering, modeling, prototyping and testing services to manufacturers worldwide. As of 2010, Italdesign employs 800 people. On August 9, 2010, Volkswagen subsidiary AUDI AG’s subsidiary Lamborghini Holding S.p.A acquired 90.1% of the shares of Italdesign Giugiaro S.p.A, including the brand name rights and patents. The remaining shares were sold to Audi on 28 June 2015, with Giorgetto Giugiaro resigning from the firm at the same time. Former Volkswagen AG Chairman Ferdinand Piëch apprenticed at Italdesign during the summer of 1972, learning about engineering and design. Italdesign is responsible for the design of several notable Volkswagen vehicles including the first generation Volkswagen Golf (1974), Volkswagen Scirocco (1974) and Volkswagen Passat (1973) and the Audi 80 (1974). Under Volkswagen Group ownership, Rupert Stadler is the Chairman of the Board and Jörg Astalosch is CEO. ^ a b c VOLKSWAGEN AG 2010. ^ a b c d Automobilwoche 2010. ^ a b c d e f g VOLKSWAGEN AG 2010a. ^ a b c Italdesign 2011a. ^ a b c Italdesign 2011. ^ a b Italdesign 2010. ^ a b c d e f Conceptcarz 2011. ^ Ciferri, Luca (2 July 2015). "Legendary car designer Giugiaro quits company that bears his name". Automotive News. ^ a b Ciferri 2010. ^ "Italdesign Automobili Speciale". Italdesign. Retrieved 8 September 2017. ^ "Italdesign Company". Italdesign. Retrieved 8 September 2017. ^ "Ssangyong relaunches brand with Giugiaro-designed Korando". Cardesignnews. Retrieved 13 October 2010. Ciferri, Luca (2010-05-25). "Volkswagen says Italdesign purchase will boost its growth strategy". autoweek.com. Crain Communications, Inc. Archived from the original on 2011-02-22. Retrieved 2011-02-22. "Info - Contacts". italdesign.it. Italdesign Giugiaro S.p.A. 2011. Archived from the original on 2011-02-22. Retrieved 2011-02-22. "Italdesign History". 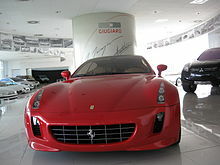 www.conceptcarz.com. conceptcarz.com. 2011. Archived from the original on 2011-02-22. Retrieved 2011-02-22. "Volkswagen Group takes majority shareholding in Italdesign Giugiaro" (Press release). Italdesign Giugiaro S.p.A. 2010-05-25. Archived from the original on 2011-02-22. Retrieved 2011-02-22. "Volkswagen Group takes majority shareholding in Italdesign Giugiaro" (Press release). VOLKSWAGEN AG. 2010-05-25. Archived from the original on 2011-02-22. Retrieved 2011-02-22. "VW schließt Mehrheitserwerb an Giugiaro ab" [VW completes acquisition of majority of Giugiaro]. automobilwoche.de (in German). Crain Communications GmbH. 2010-08-09. Archived from the original on 2012-08-03. Retrieved 2012-08-03.